Pay Per Click - Sagemont Inc.
Pay-Per-Click advertising places an ad for your business directly in front of the people that are actively searching online for your products and services. PPC advertising is far more complex that it may seem. Our Google Adwords Certified Partner has built and managed hundreds of successful pay per click programs for businesses of all types and sizes. We review your website and develop a list of keywords that best describe your products/services. We write highly targeted ads designed to entice your potential customers to click on your ad over all others. When customers search for a keyword in your campaign, your ad appears on the search results page of Google, Bing. When a customer clicks on your ad, we take them to the page on your site that has the information that best matches their search. We continually search for new keywords, write new ads and adjust bids. Your campaign data is analyzed and adjusted daily against the goals we have established for the campaign. 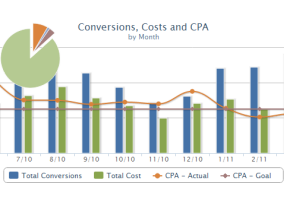 Our PPC Campaign ROI is 100% Measurable ... and Tracked! Unlike traditional advertising and marketing formats, PPC campaign return on investment is 100% measurable. Our reporting services will tell you what happens when a visitor clicks on your ad and lands on your Website. You’ll know which clicks convert to a sale, phone call, sign-up or any goal that you wish to measure. We can also email regular updates and at month-end, you’ll receive a comprehensive report. Because the content on your website can make all the difference in persuading a customer to buy from you instead of your competitor, we also offer a Landing Page design and development service. A landing page is extremely targeted to a set of keywords and contains a special offer or enticement that inspires the customer to place an order. We have seen ROI improve dramatically with a well-executed landing page. If you’re getting traffic to your site but people aren’t buying, a professionally designed landing page may be all you need. Want to get your PPC campaign on the right track?